My husband likes chicken served every way possible, so it frequently finds it’s way to our table. I am convinced that chicken has endless options. There are SO many ways to prepare it. This is one of Sergi’s favorites. 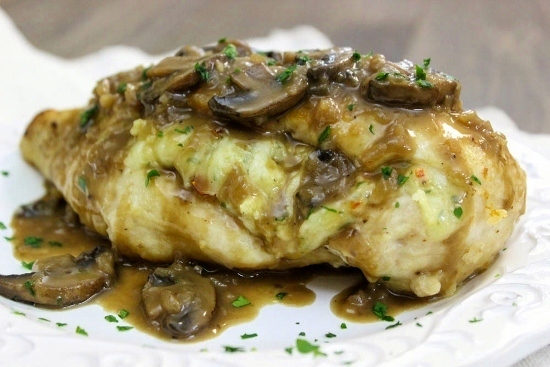 Many Italian restaurants have Chicken Marsala on the menu. This is my variation of this popular classic. 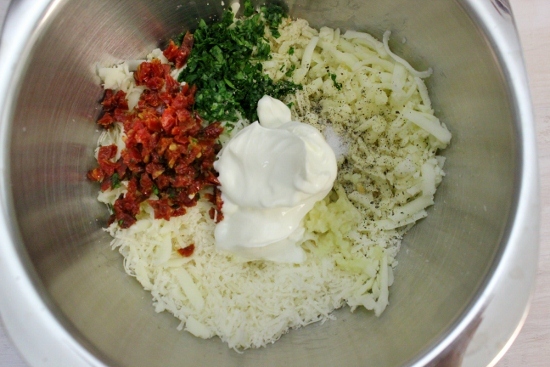 The stuffing is made with three cheeses – mozzarella, provolone and parmesan, with sun-dried tomatoes, garlic, fresh breadcrumbs and sour cream to hold it all together and give it a bit of a tang. 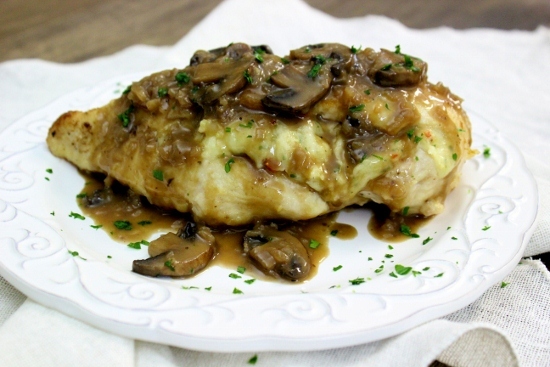 The luscious, velvety Marsala sauce pairs perfectly with this dish. 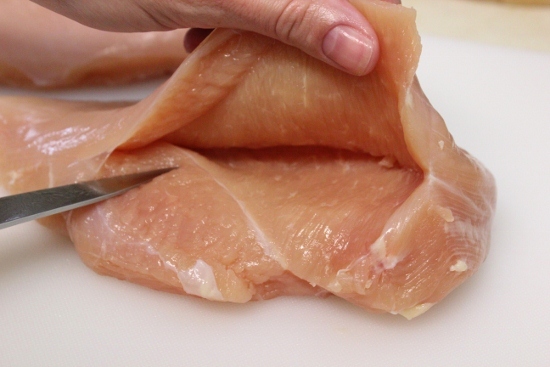 Using a paring knife, make an incision in the horizontal side of each chicken breast. These chicken breasts were HUGE. One of them was big enough for both my husband and I. 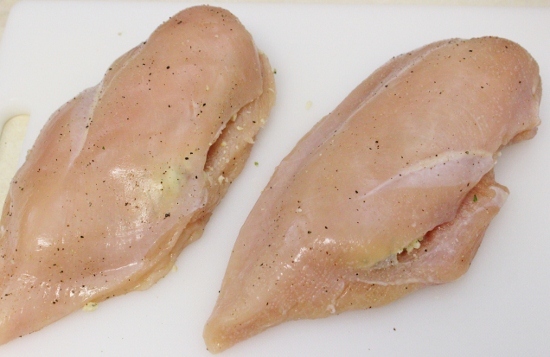 If your chicken breasts are smaller, you will have enough stuffing for 3-4 chicken breasts. 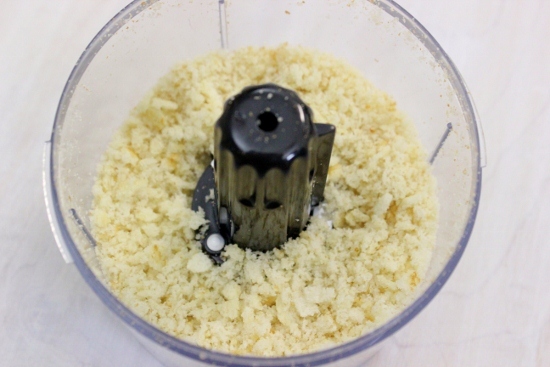 Pulse the slice of bread in a food processor to make crumbs. (You will have approximately 1/2-3/4 cup of breadcrumbs). Combine all the ingredients for the stuffing in a bowl. Mix to combine. Stuff half of the stuffing into each chicken breast. You can do all this work ahead of time and store the stuffed chicken in the refrigerator or even in the freezer until you’re ready to continue with the recipe. 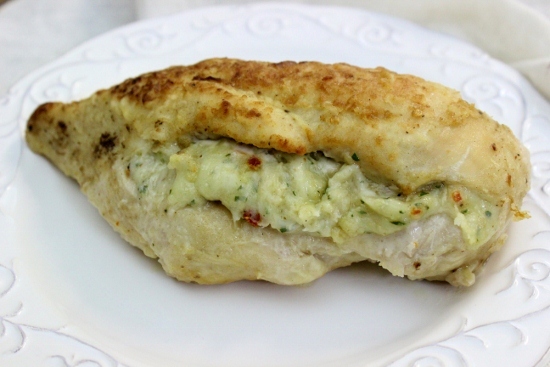 Dredge each stuffed chicken breast in flour. Heat 1 1/2 Tablespoons of oil in a skillet on medium high heat until shimmering. 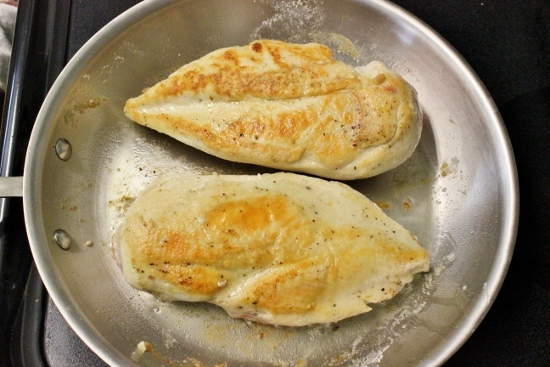 Add the chicken to the skillet and cook until golden on both sides, about 3 minutes per side. 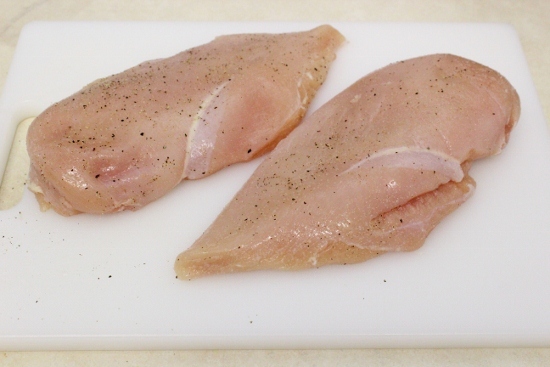 Place the chicken in a baking dish and bake in a preheated 350 degree oven until the chicken reaches 165 degrees. Meanwhile, in the same skillet, add about 1/2 -1 Tablespoon of oil or butter and heat on medium high heat until shimmering. Add the mushrooms and onion. Season with salt and pepper. 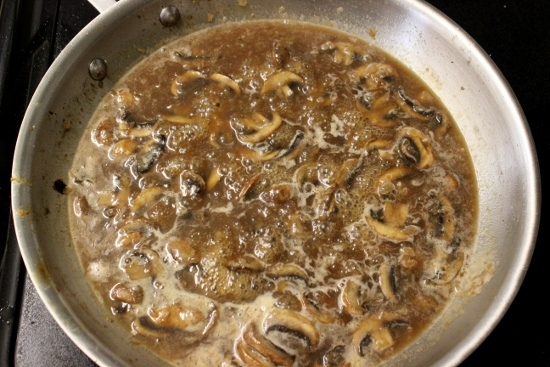 Cook for 5-7 minutes, until the mushrooms are golden and the onions are tender. Add the garlic and cook for another minute. Add the flour and mix until thoroughly mixed in. Add the wine and chicken broth, whisking vigorously, to prevent lumps. 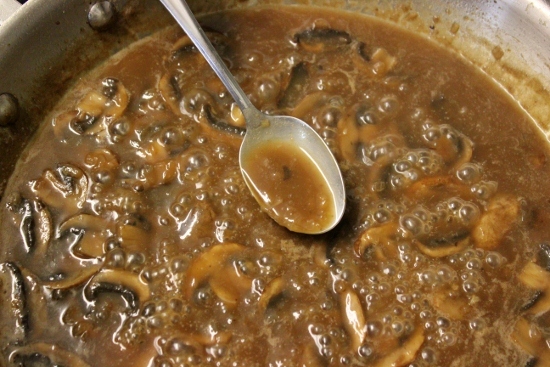 Bring to a boil and cook for 5-7 minutes, until sauce has thickened and reduced. Add the heavy cream. Season with salt and pepper. Add the lemon juice. If you don’t serve the sauce right away, it will thicken and you may need to add a bit of chicken broth to loosen it up a bit. You will need to add more broth if you reheat the sauce later too. Pour the sauce over the chicken. Garnish with parsley. 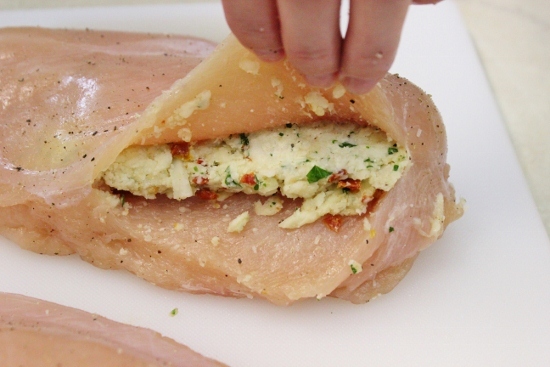 Using a paring knife, make an incision in the horizontal side of each chicken breast. Season the chicken with salt and pepper. 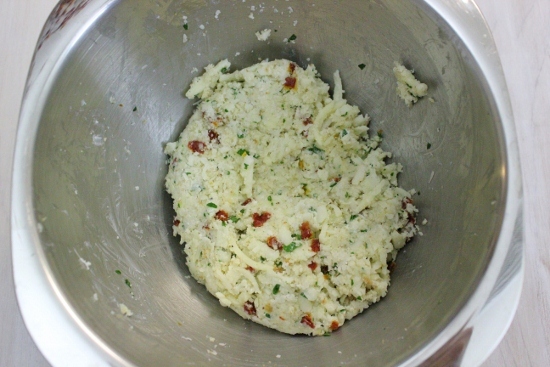 Pulse the slice of bread in a food processor to make crumbs. (You will have approximately ½-3/4 cup of breadcrumbs). Combine all the ingredients for the stuffing in a bowl. Mix to combine. 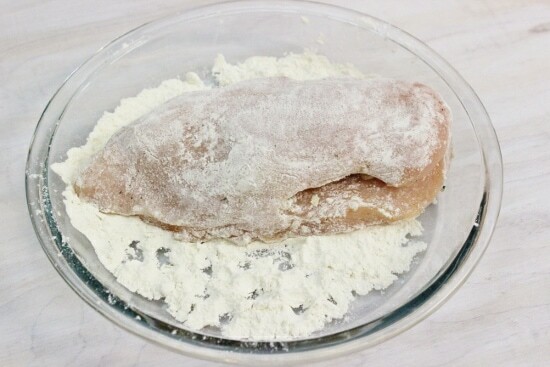 Dredge each stuffed chicken breast in flour. Heat 1½ Tablespoons of oil in a skillet on medium high heat until shimmering. Add the chicken to the skillet and cook until golden on both sides, about 3 minutes per side. 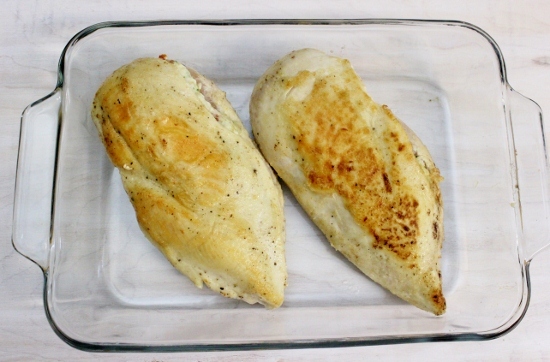 Place the chicken in a baking dish and bake in a preheated 350 degree oven until the chicken reaches 165 degrees. 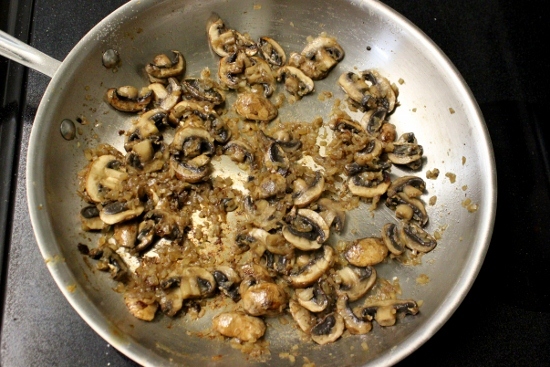 Meanwhile, in the same skillet, add about ½ -1 Tablespoon of oil or butter and heat on medium high heat until shimmering. Add the mushrooms and onion. Season with salt and pepper. 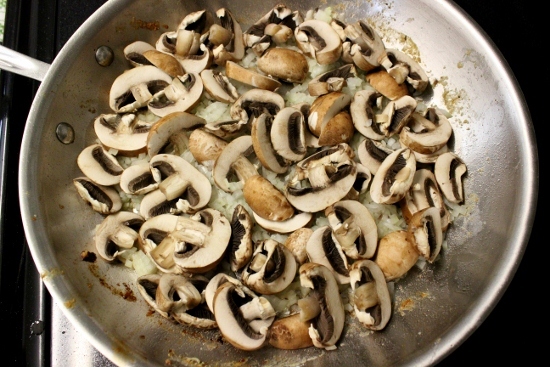 Cook for 5-7 minutes, until the mushrooms are golden and the onions are tender. Add the flour and mix until thoroughly mixed in. Add the wine and chicken broth, whisking vigorously, to prevent lumps. Season with salt and pepper. Add the lemon juice. Pour the sauce over the chicken. Garnish with parsley. This looks so delicious, making it tonight. What brand of Marsala wine do you use and where do you buy it? I use sweet Marsala wine. I’ve used many different brands and I buy it in a liquor store. Olya we fell in love with this dish. The sauce came out a little too sweet, I guess it depends on the brand of wine. Making this again sometimes very soon, with a little less wine. I’m printing this and into my recipe binder it goes. Thank You. I’m glad you liked it, Natasha. 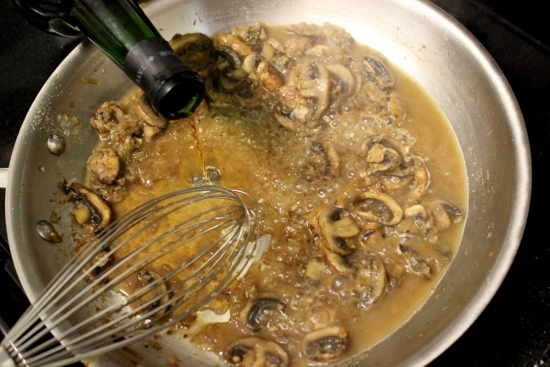 Marsala is a sweet wine, so the sauce will be on the sweeter side. 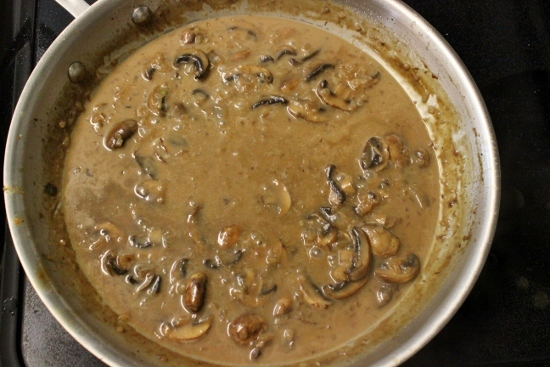 You could try using dry Marsala wine, instead, or use less wine and more chicken broth. I buy it at the grocery store its called Marsala “cooking wine ” and it is not sweet. Maybe regular Marsala wine is sweet. Olga! Love all of your recipes! They are so good I wouldn’t want to share them with anybody! Lol!! 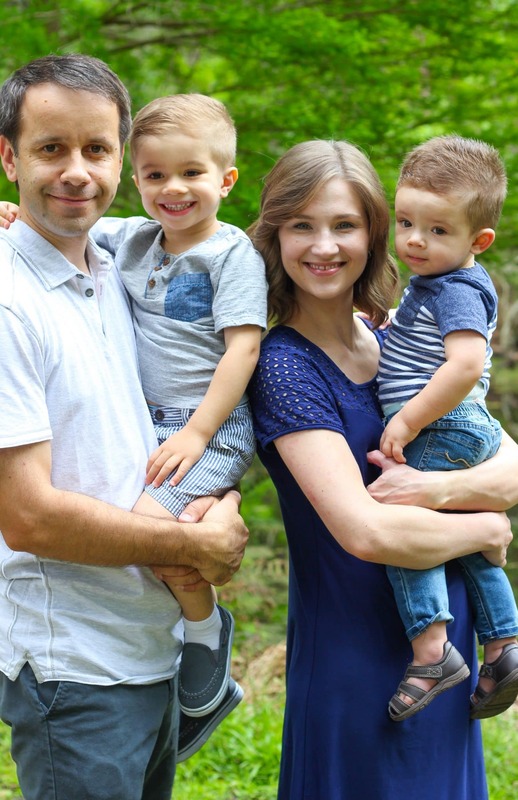 Keep up the good work and THANK YOU for sharing! Can’t wait to try this! Question: I don’t have a thermometer. 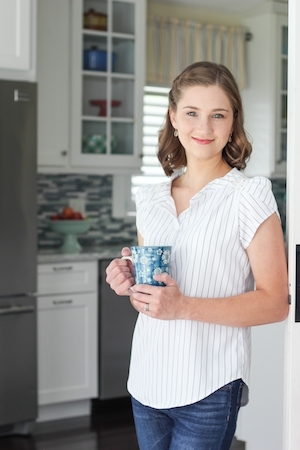 So, approximately, how much time do I need to bake the chicken in the oven? I’m glad this dish caught your eye:). It’s very hard to tell how long it will take for the chicken to cook through, since they vary in size quite a bit. it also depends on how long you cook it on the stovetop. The longer you cook it on the stovetop, the less time it will need in the oven. You can always cut it with a knife and make sure the chicken isn’t pink in the middle to be absolutely sure. Unfortunately, chicken breast is very tough if it’s overcooked, so I would definitely recommend getting a thermometer – you can get a good one for $15. You just have the best recipes ever!! My husband is same! He loves chicken for breakfast, lunch or dinner! Definitly one of my favorite to make and eat! Thank you so much for putting this up! Just came home from the grocery store getting all the ingredients I was missing. Can’t wait to try it! Dinner was scrumptious this evening! I made roasted brussel sprouts as a side to this. My whole family was happy. Even my pickiest eater, who did not want the mushrooms, said he really liked it. My husband and brother-in-law both worked at a high end Italian restaurant that served authentic italian and they said the Marsala sauce was right on the money! By sharing this recipe with us, you made a lot of people happy. Thanks again for a perfect recipe. I printed it and it’s going in my binder favorites. Thanks so much for taking the time to let me know how it turned out, Lilia:). I’m so glad everyone enjoyed it. 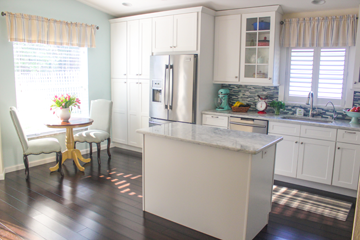 I just finding new blogs and all new recipes!!! This looks delicious!! Sooooo making it when the kids are home for the holidays!! I don’t know why my fingers didn’t type “love” in there!! Maybe not enough coffee yet!! 🙂 I LOVE finding new blogs and recipes! Olga, I would love to make this but unfortunately my husband and 3 kiddos don’t eat mushrooms 🙁 can I make the sauce with out the mushrooms? or it won’t be the same? What a bummer! Don’t you wish everyone ate everything that you liked, LOL? That would make life a lot easier. We have mushroom avoiders in our family too. 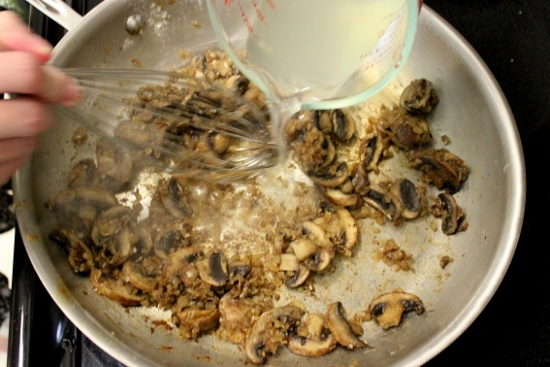 Unfortunately, I wouldn’t recommend making this sauce without the mushrooms, since they are a really important part of the sauce. They give a lot of flavor, heartiness and savoriness to it. I have served this dish to people who don’t eat mushrooms – I just cut the mushrooms into really big pieces, leaving them whole or cutting them in half, that way those people can simply not put the mushrooms on their plate but still enjoy the sauce. They all eat the sauce and pick out the mushrooms without complaining and still rave about how good it tastes:). 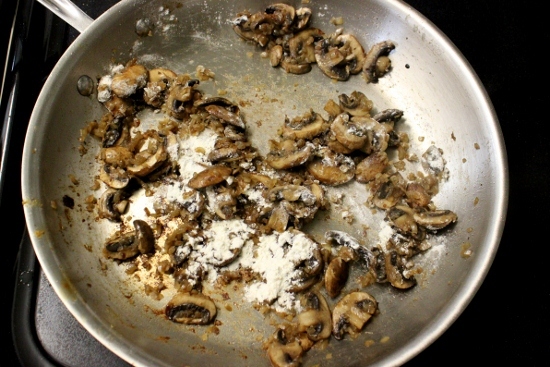 If you want to leave out the mushrooms completely, the sauce won’t taste the same. In that case, I would recommend using more chicken broth then Marsala wine to give it more flavor. I made this when we had guests over and was so nervous how it was going to turn out because it was my first time making it.. but it didn’t seem like it was hard so i gave it a try..(praying the whole time that it would be good) and I’m so glad the guests loved it! They all complimented me on how good it was so i had to come back and say thanks to you for sharing your recipes with us! Thank you so much for taking the time to let me know that you all enjoyed it! I’m always thrilled to hear your success stories. na cho ya mogy zamenit marsala wine? or can i used different wine, if yes kakoj tu posovetyesh ? Marsala wine has a very distinct flavor. If you use any other wine, it will have a completely different flavor. You can use another wine, but I wouldn’t recommend it for this recipe. 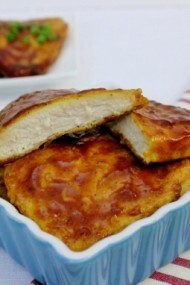 Could I use chicken thighs instead of chicken breasts for this recipe? I really don’t know how you would get the stuffing to stay inside the chicken thigh. You could give it a try, though. I tried it and some of the stuffing came out a little but it was very delicious!!! Thank you for sharing the recipe! This looks delicious!! I couldn’t find sweet marsala wine so I just bought plain marsala wine. Will it work for this recipe? Any Marsala wine will work here, Sveta. I hope you like it:). If I dont have Marsala wine can I just use 2 cups chicken broth instead of one? Or do I just use 1 cup chicken broth and no wine? Anna, You can use the same amount of chicken broth instead of the wine, in addition to the chicken broth. It won’t be Chicken Marsala, though, and will taste completely different. Sorry about that, Olga. It’s fresh parsley. Thank you for replying back so fast. 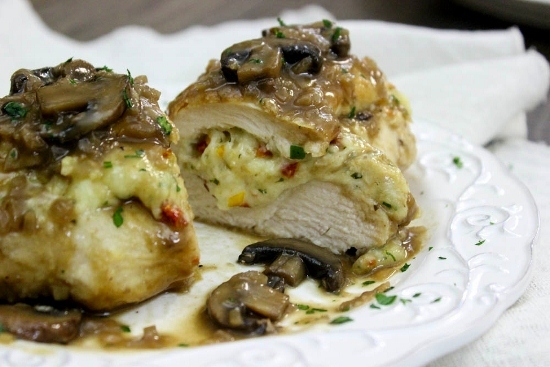 All of your recipes that I’ve done from ur page turned out amazing, they’re easy to follow and very delicious and I can’t wait till tonight to do the Stuffed chicken marsala. Thank you for all the hard work u put in this website to make it easier for us. MAY GOD BLESS!!! Dinner in the oven waiting for the husband’s arrival – those words sound like magic! I’m sure your husband was happy:). I made Stuffed Chicken Marsala, what a winner! Straight into family recipe book. My hubby couldn’t stop eating. Hi Aida! Welcome! I’m so glad you stopped by and the Chicken Marsala caught your eye. Thanks so much for taking the time to let me know that you enjoyed it. Олечка, спасибо тебе за рецепт – я со своим любимым сделали это блюдо вчера и нам очень понравилось!!! That’s awesome, Yulia! Thanks so much for taking the time to let me know. Thank you for this recipe! Can’t wait to try this! Any recommendations for an appetizer and side dishes to go with this dish? Olga, my honey and I have a misunderstanding about the quantity of onion this recipe asks for. By 1 onion, how many cups do you mean? There are so many sizes of onions – really tiny ones and gigantic. I’m used to large onions and my honey always used small one, so we cannot interpret from images the quantity of onions that is needed to make this delicious meal. Thank you for your reply! Absolute deliciousness! 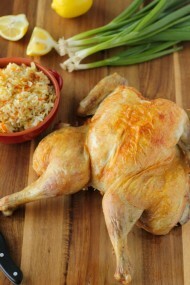 I made this chicken recipe when my family came to visit, they all liked it very much, no leftovers. Thanks so much Olga! A trick that helps to keep that cheese stuffing inside the chicken from oozing out too much is to make sure that the slit you cut into the chicken is as small as possible. I have even started to make the slit in the chicken 1/4 of what it is in the picture. 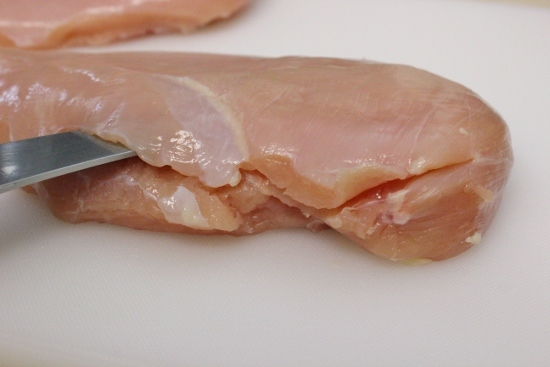 Just cut a slit with your knife only as wide as your knife, and then turn the knife around inside the chicken breast, making an opening on the inside, but not cutting through. I hope that makes sense. YOu can also use toothpicks to secure the opening.